The laundry room is often small and supposed to be entirely functional, but doing laundry doesn’t have to feel like a chore in a beautiful, organized space. Laundry rooms are now an extension of a home’s living area, so they often have windows, furniture, and pendant lighting to make them more appealing. Cabinetry is more thoughtful as well. Laundry sinks differ from other sinks due to their wide, deep basins that are perfect for hand-washing delicate clothing, bathing small pets, and cleaning large household tools. Around them, it’s best to have a combination of closed cabinets and open shelving… and maybe a few long bars for hanging wet items. Open shelving over the sink, with or without trendy storage baskets, are great for easy access to soaps, disinfectants, sponges, and containers. Closed overhead cabinets work well for keeping cleaning agents out of the reach of children. Long storage cabinets near the room’s corner can hold brooms, vacuums, and an ironing board. Open shelving underneath the sink can accommodate laundry baskets and buckets. Some laundry rooms also have built-in pet stations with a low pull out drawer for food and water bowls, higher cabinets for pet food storage, and shelving for pet toys (A countertop can even be extended to make room for a cozy pet bed or crate underneath). For all cabinetry, choose simple, functional hardware. Whether you prefer cups, knobs, or handles- larger, easy-to-grasp hardware makes tasks faster when your hands are wet or soapy. 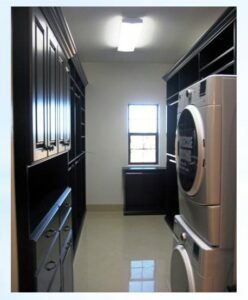 Any style of cabinetry can work well in the laundry room and be sure to consider bold colors for a fresh look. Cornerstone Cabinet Company has designed custom cabinetry, countertops, and innovative storage solutions to transform many local laundry rooms like this Tempe Contemporary Home. Make laundry day the best day of the week!